Explorer Samuel de Champlain was sailing along the North American coast in 1604 when he happened upon the mouth of a mighty river. He checked his calendar and noticed it was June 24 - St. John the Baptist’s Day and so the river claimed for France was christened the Saint John River. French Acadia was lost to England with the Treaty of Utrecht in 1713 and settlers from the New England colonies began drifting into the valley. With the American Revolution that steady trickle became a torrent. The British crown offered land grants along the Saint John River to 14,000 “Loyalists” departing the newly formed United States. Settlements grew on both sides of the river mouth - Parrtown on the east and Carleton on the west. 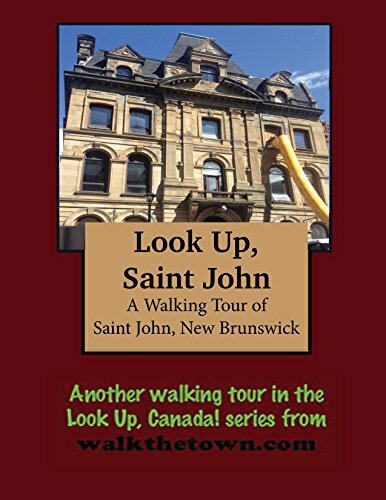 The two groups were quickly joined by royal charter and in 1785 the City of Saint John became the first incorporated city in British North America. By the middle of the 1800s Saint John was humming, only Montreal and Quebec City were more imporant towns. Shipbuilding was the main economic driver and it was estimated that the harbor was home to the fourth largest accumulation of vessels in the world. A serious body blow to the city’s fortunes was delivered on June 20, 1877 when a small fire in a warehouse in the York Slip triggered a city-wide conflagration. Nearly half of the city was destroyed. Nearly all of Saint John’s buildings had been constructed from wood and the offical tally was 1,612 structures lost. While some 13,000 people were without a home, “only” 20 lives were claimed by the blaze. Even while directing operations from tents, reconstruction - in brick and stone - began immediately. Many businesses were permitted to set up shop in temporary huts in Kings Square in the center of town, with the stipulation that they be gone by May 1, 1878. And “Shantytown” was indeed gone a year later as new buildings wnet up at a dizzying pace. By the summer of 1879, nearly 90% of the city was rebuilt. Within four years there were over 1,000 new buildings in downtown Saint John. This open space in the heart of the city traces its origins to the 1780s. For most of its early years peopleused the square to butcher cattle and roast oxen. In 1884 Kings Square began to assume the appearance it projects today with walkways and grass and trees. The King Edward VII memorial Bandstand arrived in 1908, courtesy of the City Coronet Band. The two-story high structure boasts a copper roof and filigree metal framework. Two years later, on the west side of the square, a six-foot bronze statue was installed to Sir Samuel Leonard Tilley, one of the Fathers of Confederation. Other monuments in King’s Square remember Saint John soldiers lost in war; Charles Gorman, one of the city;s most fabled athletes; and John Frederic Young who perished attempting to rescue a young boy in a storm in Courtney Bay in 1890. WALK TO THE NORTHWEST CORNER OF KING’S SQUARE AT THE INTERSECTION OF KING SQUARE NORTH AND SYDNEY STREET. This is the land set aside as a burial ground in the original plat of Saint John, developed by Paul Bedell. The first burials were in 1783. In 1848 the graveyard gates were closed and burials ended. After that the site became a memorial garden. Construction began on this courthouse in 1826. Plans were drawn by local architect John Cunningham, a Scotsman who started his career as a stonemason. Cunningham was responsible for many of Saint John’s early buildings and here tapped the Greek Revival style for the facade. The interior is highlighted by a free-standing circular staircase with cantilevered stone steps. It is the only one of its kind from the 19th century in Canada. In 1924 the courthouse was renovated under the direction of Garnet Wilson, who practiced architecture in Saint John for 45 years. It still serves the justice system and is open to the public for tours. This diminutive two-story stone building stands as the earliest example of a Canadian fire hall. It was built next to the courthouse in 1840 in a similar Greek Revival style by the same architect, John Cunningham. The volunteer brigade of No. 2 Engine House used the station for over 100 years, until 1949. It has since been converted into a museum, presenting the story of fire fighting in Saint John. TURN RIGHT ON KING SQUARE SOUTH. The Imperial opened as a vaudeville house in 1913. The restrained Italian Renaissance design came from Philadelphia architect Albert Westover and was capable of handling 1,500 theater goers. When “talkies” arrivedin 1929 the Imperial was converted into a movie house. Like most urban cinemas the Imperial suffered a decline in the middle of the 20th century and closed in the 1950s. After decades of use by a religious group the performance stage was rescued with a $1 million facelift and returned to duty as the Bi-Capitol Theatre. In the 1920s businessmen in mid-size towns were busy building statement hotels that could stamp them as “big city.” In Saint John that guest house was the Admiral Beatty Hotel, with the Canadian Pacific Railway as a lead investor. The esteemed architectural firm of Ross and Maconald of Montreal was recruited to draw up the plans and the hotel specialists delivered an eight-story Neoclassical confection. Stone and brick was used in construction, which was completed in 1925 on the site of the former Dufferin Hotel. Each of the more than 200 rooms was outfitted with its own private bath, the mark of an early 20th century luxury hotel. The Admiral Beatty, named for Admiral of the Fleet David Beatty, continued to greet guests until 1982. Four years latter the space was repurposed as 112 senior citizen apartments known as the Rotary Admiral Beatty Complex. The Public Market Hall opened in 1876 and survived the Great Fire the next year. The architectural firm of John Thomas Charles McKean and Ernest G. Fairweather drew up plans for the Second Empire Building that includes an interior roof designed to look like a ship’s hull. The graceful wrought iron elements are testament to local craftsmanship. The market is still open six days a week and is considered to be the longest continuously operating public market in Canada. TURN LEFT AND WALK ALONG EITHER SIDE OF THE CITY MARKET (OR THROUGH IT IF THE MARKET IS OPEN) TO GERMAIN STREET. TAKE NOTE OF THE 1995 ENTRANCE TO THE MARKET AND THE THE “FIGUREHEAD” SCULPTURE BY LOCAL ARTIST CAROL TAYLOR THAT IS A NOD TO THE DAYS OF WOODEN SAILING SHIPS. TURN RIGHT AND WALK NORTH ON GERMAIN STREET. This is Saint John’s oldest brick building, a simple three-story Georgian structure raised by Joseph Nutting in 1819. Nutting was the Collector of Customs in the port city. Like thousands of English loyalists from the revolting American colonies Thomas and Amy Merritt brought their seven children to Canada in 1783. The following generation prospered and the third son David began construction of a house on this property, tucked inside the then-northern bounds of the city, in 1810. Thanks to the intervention of another war between the British and Americans the house was not ready until 1817. The Federalist style home survived the Great Fire of 1877 and stands as the oldest unaltered building in Saint John; it is open to the pubic as a museum featuring early 19th century furnishings. CONTINUE ACROSS UNION STREET, THE ORIGINAL NORTHERN BOUNDARY OF THE CITY. HERE THE STREET NAMES CHANGE. Sited prominently at the head of influential Wellington Row, this Gothic Revival church broke from the tradition of using wood as a building material in Saint John. As such townsfolk routinely called it “the stone church.” Busy John Cunningham drew up the plans for the sanctuary of the Anglican church that was raised between 1823 and 1826. The nearby chancel, which features a more formal Gothic style by local architect Mathew Stead, was an 1872 addition and the parish hall came along in 1891. As the 19th century turned into the 20th steel magnate Andrew Carnegie met with financier J.P. Morgan to sell his U.S. Steel company. Morgan asked Carnegie to write his asking price on a slip of paper. Carnegie wrote down $400 million and slid the paper across the table. “Congratulations, Mr. Carnegie,” Morgan said. “You are now the richest person in the world.” Carnegie set about to give away his fortune and his pet project was public libraries. Carnegie eventually funded 2,509 libraries, including 125 free libraries in Canada. The Saint John library, boasting a three-story rotunda, was built in 1904 as the only Carnegie library in the Maritime provinces. In the 1980s, its days as a library over, the Neoclassical building was re-purposed as the Saint John Arts Centre. John Rogerson was the go-to woodcarver in Saint John in the middle of the 19th century. His work could be seen on ship figureheads, furniture and doors around town. Here is one example in the pedimented doorway. Chipman Hill Suites has restored several buildings around town as guest houses, including this similar pair, constructed for a pair of brothers-in-law. The current seat of Saint John government was erected in 1970. At 55.2 metres tall it is the city’s second tallest building. This is an authentic country store from the 19th century but it had nothing to do with George and William Balfour’s food processing company which they founded in Saint John in 1867. it was the idea of Ralph Brenan, a one-time Balfour employee, to rekindle interest in the old-time general store in conjunction with the country’s centennial celebration in 1967. So, using Balfour Company money, a country store was hauled from the northern province was towed intact down the Saint John River and placed in the center of the city to serve as a museum. James Domville was born in British Honduras in 1842, the son of a major-general in the British Army. He became a commander in the New Brunswick militia and an active businessman with interests in importing and exporting and local iron mills. Domville went to Canadian House of Commons as a Conservative in 1872 and was a Senator when this Second Empire-style building was constructed with sandstone in 1881 to house his Maritime Bank of Saint John. Each story is progressively a little shorter than the underlying one to project the illusion of a taller building. Domville was also instrumental in founding the Saint John Public Library. This was the business address of James Manson, importer of “British, Foreign and American Dry Goods.” Manson outfitted his emporium with ornaments on the exterior and the heaviest London plate glass for his storefront windows. Manson opened his business in 1855 and was immediately profitable. In addition to rebuilding this store after the 1877 Fire Manson was able to open branch stores throughout New Brunswick. CONTINUE MOVING DOWNHILL ON PRINCE WILLIAM STREET. Isaac Burpee was born in Sheffield, New Brunswick in 1825 and established himself as a merchant and entrepreneur. He was elected to the House of Commons in 1872 as a Liberal and occupied several government posts until his death in 1885. His mid-block Italianate-styled office building here was fashioned from sandstone and brick and housed the family hardware business. A later occupant was junk broker Rudolph Mayer who was the brother of Hollywood big shot Louis B. Mayer. John Armstrong, a prominent Irish merchant, built this four-story brick commercial building in the aftermath of the 1877 fire. It is notable for its heavy concrete Italianate-style window hoods and the cast iron columns and cornice above the first level storefront. Flewwelling Press Limited opened its doors in 1877 and has been in business ever since; it is one of Canada’s oldest companies. Imaginative brickwork is the driver of interest on this Italianate-styled building. Henry Chubb, the son of loyalists, was born in Saint John in 1787. He grew up to wear many hats: printer, militia officer, newspaper publisher, businessman, politician, and justice of the peace. In 1811 he started his own newspaper, the New-Brunswick Courier, which printed maritime notices and news from foreign dispatches. In 1846 the operation was moved into a brick building on this corner where it became a social hub where financial men could trade securities, auction land and check the bulletin board for important news. Chubb himself had helped found the Merchants’ Exchange. His sons George and Thomas took over the paper after his death but the Courier was shuttered in 1865. The Chubb business had contracted to just printing and bookselling when the Great Fire struck in 1877. The new brick building at Chubbs Corner was a bit more ornate than most of its fellow replacements but it truly stood out for the 16 carved heads of prominent Saint John public figures of the age, inserted into alcoves around the third floor. George Chubb was front of center, wearing a bowler hat. The carvings were executed by local stonecarver James McAvity and stirred up a hornet’s nest of derision among the powers that be in Saint John. Thomas Furlong was a purveyor of fine spirits when he constructed this corner showcase in 1879. It was here residents would come for the best imported sherries and wines and brandies. In his non-professional life Furlong was known for his love of art and good books. He sailed to Saint John from Dublin, Ireland in 1850 and laid the groundwork for his merchant business by spending seven years in Philadelphia. Furlong’s passion for the arts is echoed on the facade of this colorful Italianate five-story structure, which is adorned with gargoyles and other fanciful sculptures. RETRACE YOUR STEPS BACK UP THE HILL TO PRINCE WILLIAM STREET AND TURN RIGHT. After the Great Fire of 1877 this was one of the first fire-resistant stone buildings to rise from the conflagration. The three-and-a-half story Second Empire civic building on the waterfront stood as a beacon during the city’s reconstruction. Thomas Scott, the Public Works Department’s lead architect, helmed the project with local architect Matthew Stead providing on-site revisions. The ornate stone design was laid on top the city’s first iron frame structure that rose on the ashes of the former post office. The Old Post Office did duty from 1881 until 1915; today it has been redeveloped as condominiums. The Bank of New Brunswick took its first deposits in 1820 as the first chartered bank in Canada. John Robinson, who fought in the American Revolution on the side of the was named the first president of the enterprise. He was also the treasurer of the province and so became the bank’s best customer as well. This building was constructed in 1879 on plans drawn by Henry Starbuck and intended to replicate the appearance of its predecessor destroyed in the 1877 Fire. The six fluted Corinthian columns are flanked by two Corinthian pilasters. The bank dissolved into the Bank of Nova Scotia in 1913. The one-time Neoclassical banking temple is now event space. William Munson Jarvis was a force in Saint John affairs for over half-a-century as an agent for the Maritime Provinces of Canada for the Liverpool and London Globe Insurance Company and a barrister of the Supreme Court. His commercial building is notable for its Romanesque arched windows, each with a keystone, and elegant brickwork. Even on a distinguished row of notable architecture like Prince William Street, usually known as Saint john’s Wall Street, the Palantine Building stands out. It features two entrances, each framed by an elaborate entablature supported by paired Corinthian columns. Celebrated Halifax architects Andrew Dewar and J.C. Dumaresq designed the building in 1877, the only year of their brief partnership. James McAvity contributed the carved gargoyles and floral designs on the Second Empire facade. The building took on the name of long-time tenant The Palantine Insurance Company, sellers of fire and automobile protection. The building was originally a branch of the Bank of Nova Scotia - you can still see the ghost images of the bank’s name and a gargoyle on a capital spitting coins. The wave of monumental Beaux Arts government buildings struck Saint John in 1913 with the construction of Postal Station A. The classical elements were crafted from sandstone and include a rusticated base, Corinthian colonnade and prominent cornice. The important formal building is sited directly facing the harbor. The Seaman’s Mission was the idea of Lady Alic Tilley, wife of Sir Samuel Tilley, Father of Confederation, Premier of New Brunswick, and Lieutenant-governor of New Brunswick. It provided sailors an alternative to local bars when in port at Saint John. In addition to lodging there were recreation activities and writing desks to send letters home. G. Ernest Fairweather provided the Italianate design for the three-story brick building which was raised in 1908. A renovation in the 1930s brought a 700-seat auditorium. The Seaman’s Institute departed in 1965 and the structure was rescued as part of an initiative by the city of Saint John to turn Prince William Street into Canada’s first National Historic Streetscape. Jacob Valentine Troop was born in Nova Scotia in 1809 and began his business career in Saint John as the operator of a general store. He eventually bought into trading ships in the West Indies and formed a company with his son Howard to engage in trans-Atlantic shipping. The Troops built the largest fleet of wooden sailing ships in Canada, flying the familiar diamond “T” house flag. Troop vessels set records for passage times in their day. This brick building was erected in 1883 to house the operations of the Troop Shipping Line of Saint John, two years after Jacob Troop died from injuries sustained in a fall. The firm left the building in 1912. Herbert Stanley Brenan was a local architect who spent his entire career in the design of school buildings, for his first 25 years as an assistant to F. Neil Brodie beginning at the age of 25 in 1904. After Brodie died in 1926 Brenan became the architect of choice for the Saint John School Board. His most important work was the Saint John High School, executed to his neo-Georgian vision, in 1931-32. The public education of Saint John began in 1805. TURN LEFT ON QUEEN STREET. TURN LEFT ONTO GERMAIN STREET, THE MOST DISTINGUISHED RESIDENTIAL STREET IN SAINT JOHN. In 1902 William cross, a wholesale grocer in charge of the Hall and Fairweather concern, began building a house next door to the Germain Street Baptist where he was a deacon. The wooden Queen Anne two-story house was completed in 1905 and remains a testament to local craftsmanship. Thomas Rankine was born in Kincardie on the shores of Forth, Perthshire, Scotland in 1803. He sailed to Canada in 1824 and baked his first biscuit on Mill Street two years later. Sons Henry and Frank joined the business as the biscuit company became incorporated as T. Rankine and Sons, Limited. This Italianate style brick house was built by Henry and designed by architect R.C. John Dunn in 1886. It is typical of the elegant homes on this block with its bow front and ornamental details such as a gargoyle that doubles as a drain spout. What is unique is the cast iron fence and railings that have been modeled after the iconic cookies sold by the Girl Guides of Canada. Joseph Bullock was born and raised in Ohio and spent his early working years in the lumber business. In his thirties he began dealing in kerosene. He came to St. John in 1869 with the intention of handling only Canadian oil but was some trading in American products and his Eastern Oil the largest dealership in oils in the Maritime provinces. Bullock moved his family into this newly constructed house in 1879 and added similar abodes for his sons Thomas, a mayor of Saint John from 1908 until 1910, and John. The Toronto architectural firm of Langley, Langley and Burke designed this Gothic Revival house of worship in 1878 following the 1877 conflagration. The St. Andrew’s Presbyterian Church that had stood on the site since 1815 was the “Mother Church of Presbyterianism” in New Brunswick. The Parish of Saint John congregation was the city’s first, erecting a small house of worship in 1791. After that building was destroyed by fire the cornerstone of the present church was put in the ground in 1879. The Gothic Revival design was contributed by Montreal architect William Tutin Thomas. The stone church, boasting a steeple 200 feet high and visible from every point in town, was ready for services in 1880. The chimes head in Saint John every half hour emanate from the tower. The Royal Coat of Arms in the Trinity Church were hauled from the Old State House in Boston during the American Revolution and rescued again from the original Trinity Church during the Great Fire of 1877. The Grand Lodge of New Brunswick was formed in 1867 and job one was to create a suitable home for the various Masonic bodies in the city. Initial money was raised from rental properties until they were wiped out in the June 20, 1877 destruction. The cornerstone for this temple was laid in 1878. The architects were George Ernest Fairweather (Albion Lodge No. 1) and John T. McKean (St. John’s Lodge No. 2). Contracting was done by Alexander Christie and John Ferguson (Union Lodge of Portland No. 10). The total tab for the Masonic temple would eventually come in at $70,000. RETRACE YOUR STEPS TO PRINCESS STREET AND TURN RIGHT. Sir William Johnstone Ritchie was a Nova Scotia native who left for New Brunswick in 1838 when he 25 to practice law. He soon was the most successful barrister in Saint John. In 1865 Ritchie was appointed Chief Justice of New Brunswick and he eventually landed on the Supreme Court of Canada. In 1879 Ritchie was named Chief Justice of Canada and he served almost 14 years, longer than any Chief Justice before or since. When he wasn’t engaged in the law, Ritchie indulged in a passion for the law. He designed buildings he owned, including one on this corner which he constructed in 1843 and housed his law practice. After the Great Saint John Fire of 1877 the current structure was built; it is believed the walls and foundation of Ritchie’s first law office were used in the new building. This expansive Romanesque-style red brick building was constructed into this corner hillside lot in the early 1890s. It features Romanesque-styled arched windows, including an arched doorway with the words “Provincial Building” carved into it. After Lady and Lord Aberdeen graced Saint John with a visit in 1894 the premises became the Hotel Aberdeen. In 1902 the ten-year old New Brunswick School of Law moved its law library here and at the same time a slew of government offices, including the Supreme Court chambers, took up residence. The Provincial Building has been redeveloped as private upscale housing. TURN RIGHT ON CANTERBURY STREET AND CONTINUE TO KING STREET. This building carries the name of William Vassie who established a dry goods business here in 1832. But a more famous historical figure called this property home before Vassie - Benedict Arnold lived here for six years in the 1780s after defecting from America. Arnold, who got around with a cane after his wartime adventures, was active in the shipping business. He was scarcely more popular in Canada than he had been in the American colonies and he was often embroiled in shady business deals and petty lawsuits. At one point the townsfolk burned him in effigy out on King Street in front of his house. The Arnolds sailed for England in 1791 where he died ten years later. The current brick building was constructed after the town burned in 1877; if boast Italianate details in its four stories of bricks and stones. TURN RIGHT ON KING STREET. The Royal Bank of Canada was established in 1901 to reflect larger ambitions from its founding in Halifax in 1864 as the Merchants Bank. More than a century later it is Canada’s largest company. This four-story Neoclassical vault was built in 1904, constructed with a steel frame. The exterior features Corinthian pilasters framing the windows and a scroll design under the storefront cornice that runs the entire length of the building. A highlight is the recessed entranceway on King Street that sports a pediment and a Coat of Arms consisting of a chained horse and a crowned lion. The construction of the RBC building was made possible by the tearing down of a previous structure that looked like the rest of the Italianate wall on this block of King Street. All three buildings feature ornate hooded windows and arched entranceways at the street level. After losing the fourth member of the Commercial Block the others had additional stories added to complement the height of the Royal Bank. The corner building was the home of the Canadian Pacific Railroad for more than 50 years beginning in World War I. The Canadian Bank of Commerce first occupied this Beaux Arts banking palace in 1904; the bank itself organized in 1867 with the Confederation. Its assets were merged with the Canadian Imperial Bank of Commerce in 1967 and has served customers continuously for over a century. Toronto architects Frank Darling and John A. Pearson were prolific designers of bank buildings in Canada; this was one of theirs. CONTINUE TO THE END OF THE BLOCK AND THE TOUR STARTING POINT AT KING’S SQUARE.